Musical fountains present a unique feature that will not only enhance the aesthetic appeal of your environment but also add a sense of sophistication and luxury to the establishment. Music is a language that appeals to every soul and mind, which makes musical fountains a great feature of attraction and comfort in a residential and commercial property. Since the “themes” of musical fountains can be customized, there is no limit to the effects or themes that you can create in your establishment with them. Despite the greater improvements and appeal that can be delivered through the use of musical fountains, finding an expert to handle the project is always the key to best experience. At Swimming Pool Singapore, we specialize in the design, construction, supply and installation of musical fountains for both residential and commercial property. A musical fountain is a form of animated fountain that uses sound waves, water and light in 3D to give a unique look and feel. The effects can always be timed to appear in a particular manner or pattern that complements the other features erected on the space to give a state-of-the-art presentation. Depending on your needs, the features of a musical fountain can always be changed to give a different appeal. Coming up with the best design for your home or business can be quite challenging to most people. Remember the design is the window through which you are able to view the final feature and should always take into account all your expectations. Our designers can always assist you in choosing the perfect design for your property. 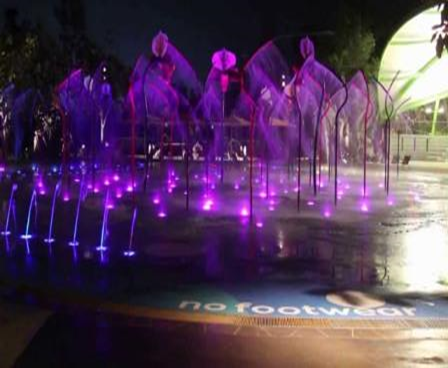 We have a comprehensive portfolio comprising musical fountain designs in different shapes and sizes from where you can pick the best for your property. We understand that sometimes we may not always get it right and you may want to make a few changes in a particular design. In such cases, our designers will note down your request and re-create the design to your specifications. Even if you need a new design created from scratch, our designers are ready to help you in getting the best. Our services are not only for new buildings but can also be integrated in old houses that are under re-modelling. In fact, we can help you design a musical fountain for just any type of property with a guarantee of the best results. For any musical fountain to function appropriately as expected, it must be constructed and installed using high quality materials, parts and accessories. For those who may not have owned musical fountains, our experts can always assist you in identifying the right equipment, parts and accessories for the feature. We stock various kinds of products for this type of fountains to ensure that all your needs are met in one-fold. In case you may need accessories or parts for a new or used musical fountain on your property, simply talk to us for the best quality. We have various kinds of products by different brands that you can always acquire for new installations, maintenance or refurbishment. All our products are tested and approved for unmatched performance and the best value for money. We have a team of technicians with great experience in the construction and installation of musical fountains to handle all our projects. Despite the design that you come up with, we can guarantee that the final feature will be an exact match. In fact, we will ensure that every slight detail presented in the design is expressed without any hitch. There are different kinds of materials used in the construction of musical fountains but we always use the best for durability and efficiency. There are sometimes whereby clients come to us with their own designs and ask our technicians to handle the construction and installation. We do not only construct or install musical fountains created by our designers but can also handle creations by other designers. All our projects are conducted by our professionals to completion to ensure that every client gets the best services. Whether you are building a new property or remodeling, we can still incorporate musical fountains to complement the other features in the establishment. At Swimming Pool Singapore, we take pride in delivering custom products and services to meet the needs of every client that we serve. Even after the installation of musical fountains in your home or business, we can still offer regular maintenance services and advise on proper management of the feature for better performance and longevity.